UnitedHealthcare teamed up with IRONKIDS for the UnitedHealthcare IRONKIDS(R) Chattanooga Fun Run to inspire and motivate young people to lead active, positive and healthy lifestyles. The UnitedHealthcare IRONKIDS Chattanooga Fun Run took place at Ross’s Landing in downtown Chattanooga, with hundreds of young people and their families participating. UnitedHealthcare mascot Dr. Health E. Hound and IRONMAN athletes led warm-up exercises with the kids, and U.S. Rep. Chuck Fleishmann and State Sen. Bo Watson were at the starting line to officially kick-off the race. Families, community leaders, UnitedHealthcare employees, IRONMAN athletes and supporters lined the course to cheer on the young runners in their quest to be “IRONKIDS.” Runners received race bibs, T-shirts and medals at the finish line. The age-appropriate ( 1/4 mile, 1/2 mile and 1 mile) course for “triathletes to be” took place along portions of the IRONMAN(R) course, which begins Sunday. UnitedHealthcare and IRONKIDS provided 100 free registrations to the Salvation Army of Chattanooga and donated $15 to the organization for each registered runner, up to the first 200 participants. The $3,000 donation will support Salvation Army of Chattanooga after-school health programs. UnitedHealthcare and IRONKIDS sponsored a health fair and training event for children the day before the fun run, providing free health screenings and conducting warm-up exercises and other activities with IRONMAN athletes and Dr. Hound. This is the third year UnitedHealthcare is supporting IRONKIDS as part of the company’s commitment to help stem the rising tide of childhood obesity through healthy lifestyles. Obesity among children and adolescents has almost tripled since 1980, with nearly one in every three children being overweight or obese, according to the U.S. Centers for Disease Control and Prevention (CDC). The UnitedHealthcare 2014 IRONKIDS North America Running Series features nine one-mile Fun Runs and a splash-and-dash, as well as music and health expos, and the opportunity to watch IRONMAN(R) and IRONMAN(R) 70.3 events with hundreds of spectators. UnitedHealthcare offers health benefits, including employer-sponsored, Medicare and Medicaid health plans, to more than 1.1 million Tennessee residents and partners with nearly 18,000 physicians across the state. For more information about UnitedHealthcare, visit www.uhc.com or follow @myUHC on Twitter. 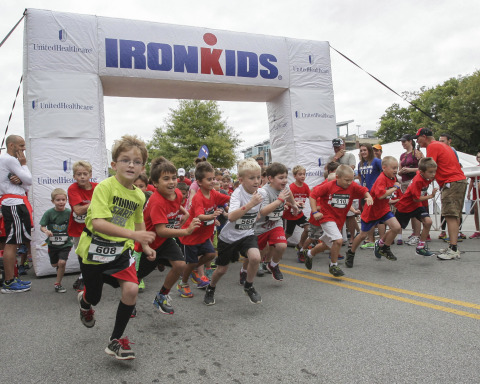 After being acquired from the Sara Lee Corporation, which owned the event series since 1985, IRONKIDS(R) launched in 2009 with nine events in the IRONKIDS(R) National Triathlon Series. Since the inaugural year, IRONKIDS has seen more than 60,000 participants and has grown to over 40 events worldwide including races in Africa, Asia, Australia, Europe and North America. The brand represents a multi-dimensional approach to creating positive experiences for athletes, families and communities as well as embodies achievement and determination while fostering self-esteem. The IRONKIDS mission is to inspire and motivate through the sport to live an active, positive and healthy lifestyle. For more information visit www.ironkids.com.